This month a team at UNIST in Korea posted their understanding of how to perfect graphene growth. 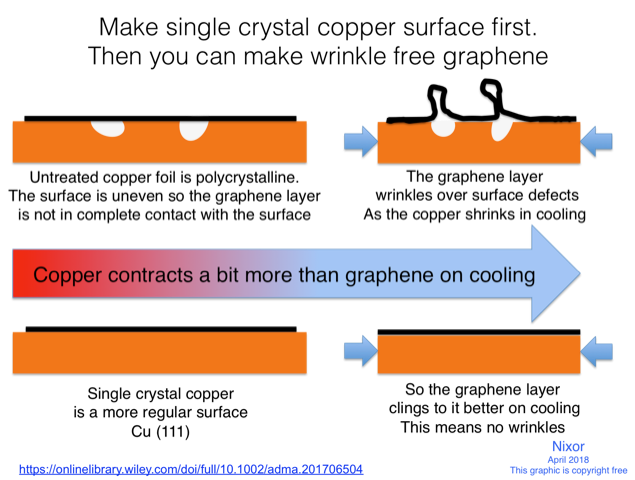 Perfect sheets of graphene (single crystal graphene) is important for making next generation electronic devices among many other things. To make wrinkle free single crystal graphene, first make the single crystal copper surface on which it can grow. We now know why graphene wrinkles when the copper surface is polycrystalline. Making the surface a single crystal of copper increases the adhesion of the graphene on the surface stopping it wrinkling as the metal cools. Oh, and this graphic is free to use, I made it so there are no copyright restrictions.